Porky's Pizza Corona Hills is a long time local favorite of Corona residents. Porky's uses their original pizza sauce, the freshest ingredients, delicious crust, straight out of the oven and you have got one of the top pizza's in Southern California. 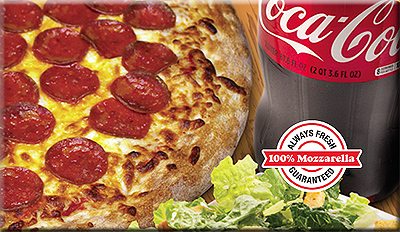 Porky's Pizza has everyone's favorite toppings, specialty pizza and create your own options. Don't forget about Porky's mouth watering Buffalo Wings, Fresh Salads and Garlic Knots! Top it all off with everyone's favorite Porky's Cinna Knots or New York Cheesecake! Visit our site for Deals, Discounts and Family Specials! Voted Top 5 Pizza Makers in Southern California.. Throwing a party, Big Game at your house, Team Party, Kids having friends over? Porky's has the right size pizza or party platter to feed even the hungriest of parties! Everyone loves hot pizza, delicious wing's and fresh salads. Take the worry out and enjoy your event, Let Porky's Pizza do the work!